Christmas is less than two weeks away, and you know what that means! It’s holiday party time! I’m not going to lie, I don’t celebrate X-mas, but I enjoy holiday festivities like most of America. The holiday season is one of the spendiest times of the year (did I just make that word up? Maybe I did). So you may already be strapped for cash. That’s just one REALLY good reason you should thrift your holiday wardrobe. Keep scrolling to see how I discovered 4-holiday ready outfits in under 20 minutes at my local Buffalo Exchange. Let me just tell you, I love thrifting but I completely understand the argument against it. It can take time to find a gem and the idea of wearing used clothes can be icky at first. So, throw the latter argument away because it’s complete non-sense, and use my tips and tricks to hone your thrift shopping abilities. It’s a superpower you know. It’s rare that I go to a thrift shop without a plan. All those racks are a headache to go through if you don’t know what you’re shopping for. I spotted this yellow dress, first because of it’s eye-catching color (bright colors look great on brown skin). When I pulled it from the rack, I saw the A-line silhouette and knew it would be perfect for Christmas with the family or meeting his parents for the first time. It’s classy, bright, and full of holiday cheer. Plus, the color and the crochet neckline remind me of Charlie Brown, #Christmas magic. It’s important to know what occasion you’re shopping for because it will make your shopping experience so much smoother. It will allow you to beeline straight to the shopping section of your desires. In my case, I made a beeline to the dress rack because I knew I wanted to shop for holiday dresses. Shoes: Chinese Laundry, similar style here. Tacky Christmas sweater party coming up? They have those at your local thrift shop, and cheap too! This trick narrows down your shopping selection even more. Velvet is a hot fabric for the winter season and it stands out in a rack of clothes. I knew that I wanted to have at least one velvet number and I found it in this beautiful red velvet dress with puff sleeves. 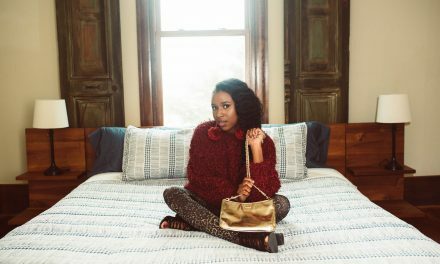 Velvet, silk, faux fur, and sequins are great fabrics to wear during the holidays. They stand out on the clothing rack and you’ll stand out at your party when you wear them. This black fitted cocktail dress because of it’s sparkly sleeves. Hello, New Year’s Eve party here I come! But what really caught my eye was the tag. This Michael Kors dress was on sale for $20! I know there are some Michael Kors fanatic fans out there. And the fact that I found this dress for under $50 and in like new condition astounded me! Now, I can’t promise that you’ll always find a sweet deal as I did, but I will say that if you keep your eye open, you might discover a real treasure. In Texas the weather doesn’t get too cold. But let’s be honest, Texas is an outlier. You’ll need a good warm jacket or shawl this holiday season. And what better time to get you first real fur. I don’t condone animal cruelty at all. I would never promote purchasing a new fur. But, if you can get your hands on a good vintage fur, why not? Let’s recycle the damage we’ve already caused. Whether you’re attending a formal dinner, a cocktail party, or a tacky X-mas sweater themed work event, make this the basis for your holiday outfit hunt. Fun winter fabrics like velvet, faux fur, silk, and sequins will standout on the racks. This will make searching for your perfect outfit easier. Keep your eyes peeled for designer steals. They are just waiting for you to pull them off the rack and give them a new home (yes, thrift clothes need love too). This is the perfect time to get your first real fur. No guilt here, you’re recycling fashion, not harming animals by purchasing new fur! I hope this post has inspired you to give thrift shopping a try, and if you already shop thrift, I hope you continue to do so. because #thriftisthenewnew. Be sure to follow me on Instagram @mybrownsparklez for more great styles and inspiration.